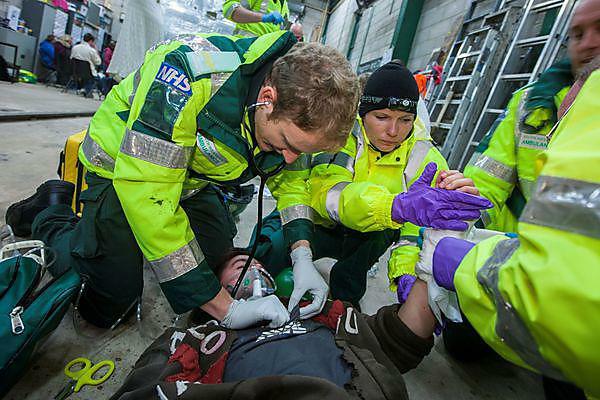 Student paramedics from University of Plymouth, Bournemouth University and the University of the West of England (UWE) got hands-on at a South Western Ambulance Service (SWASFT) event at the weekend in Bristol. The Be a Better Paramedic conference held at UWE, the first student paramedic conference of its kind, gave nearly 300 students from across the country the chance to deal with a patient in a hazardous emergency situation, find out the latest on pre-hospital assessment of sepsis or improve knowledge of mental health. These master classes, among others, were delivered by experts within SWASFT. SWASFT paramedics are among the most highly-skilled in the UK with the widest range of medicines and equipment available. SWASFT paramedics treat more patients on-site, without the need for the patient to be taken to an emergency department, than any other ambulance service in the UK. This means more patients get the outcome they need immediately. Feedback from students, for the successful event, were particularly around the popular master class sessions and opportunities to talk to, and learn from, existing paramedics, as well as the realistic hands on scenarios. Some students were first years, while others are hoping to get jobs within a few months.